Love is hard at any age. And dating doesn't get any easier. 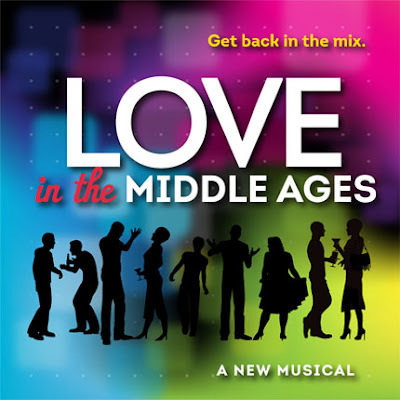 In Love in the Middle Ages, musical comedy with book by Eric Kornfeld and Jeffrey Jackson, music by Michelangelo Sosnowitz, and lyrics by Kornfeld, a group of desperate forty something's head to the JCC for an over 40s single mingle. With a Broadway pop score, the material within the libretto and lyrics are geared toward a certain demographic. The story follows six singles all looking for love in all the wrong places, each with their own reason. From the super picky Sandy looking for a replica of her ex to plain Jane who is afraid to put herself out there to Richard, the joke master host of the mingle looking for love himself. The concept is cute but truly paints these people in a light of desperation, intentionally or not. To assist in avoiding this, Kornfeld and Jackson need to beef up the backstory a bit more. Give their stories something stronger. The score by Sosnowitz is quite lively and fit well with his company. The ensemble elevated the score. Leading the ensemble were Mimi Bessette and Marci Reid as Sandy and Jane respectively. Mimi Bessette shines as the mingle addict Sandy. She brings such fire and passion that comes off as spunky and fearlessness. Reid's Jane is part hopeless romantic, part bad luck magnet. But Reid finds hope in the character. David Rappaport as the bad boy got stuck with some of the more unfortunate and vile lines. You disliked him no matter what he said. DROM is not a venue for everything. And it's proof with Love in the Middle Ages. Allowing the mingle to roam free within the space and onto the stage was the only way to utilize the space concussively but it also caused many awkward moments. Because of the nature of the venue, any scenes that did not take place in the main room, for example the bathrooms, didn't read properly. Director Lisa Shriver did all she could do with nearly all the odds against her. There were moments and her choreography was great, but there was so much that pulled the production done. Love in the Middle Ages may resonate for some people but with a specific demographic, it's a hard ticket to sell. It could find love in regional community theaters but the market for this type of musical is small.